When the Pentagon announced plans to send a team of commandos to Syria, no one seemed to stop and ask the most basic question — how are they going to get into an active war zone in the first place? Official documents show that the U.S. Air Force likely set the stage for this secretive mission years ago. One of Air Force Special Operations Command’s main missions is to sneak America’s elite troops in and out of hostile countries with its fleet of specialized aircraft. But the flying branch’s top commando headquarters also relies on specially trained airmen to first find places to drop troops and equipment. In 2013, so-called Assault Zone Reconnaissance Teams — a.k.a. AZRTs — scouted out nearly 300 landing zones, drop zones and other sites “throughout the Middle East,” according to an official Air Force history War Is Boring obtained through the Freedom of Information Act. In addition to finding suitable landing sites, the highly-trained AZRTs help coordinate missions from the ground and call in air strikes, rescue downed airmen or wounded commandos … and even watch the weather. “There’s a lot of work going on at SOC FWD locations — SOC FWD Yemen, Lebanon, Oman, all the GCC — the Gulf Cooperation Council,” a member of the 720th Special Tactics Group wrote in a February 2014 email reproduced in the historical review. Censors redacted the individual’s name. “SOC FWD” is an abbreviation for “forward deployed” special operations command centers around the world. GCC is a powerful political and economic bloc that includes Bahrain, Kuwait, Oman, Qatar, Saudi Arabia and the United Arab Emirates. All important allies for Washington, GCC members host American troops and planes at a constellation of air bases and other major facilities in the Arabian Peninsula. By 2010, the Pentagon had a commando task force dedicated to training with soldiers from all six countries. 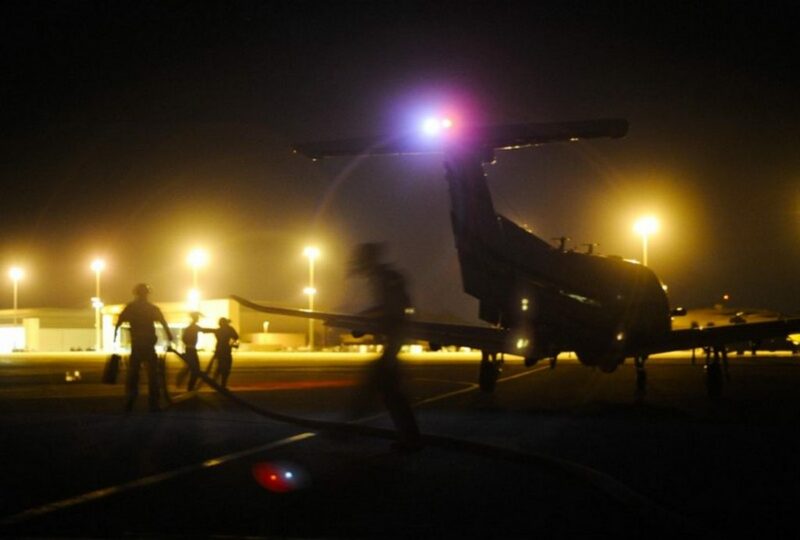 And in 2013, the Air Force provided the bulk of the manpower and aircraft to create a special aerial unit — dubbed the Joint Special Operations Air Component-Central — at Al Udeid Air Base in Qatar. When we asked, a spokesperson for the Pentagon’s top commando headquarters for the Middle East declined to tell us how many aircraft or what types are in the unit’s inventory. However, there’s no doubt the unit has specialized MC-130 tankers and unique CV-22 Osprey tiltrotors that take off like helicopters, but fly like planes. Aircraft such as the C-146 Wolfhound and U-28A — which look like civilian planes but are actually discreet commando transports and flying spooks — have been spotted in the region by journalists and amateur plane watchers using Google Earth and transponder signals. There’s more than just planes. The unit can call on troops to inspect sites on the ground, gather critical weather information and help plan missions. 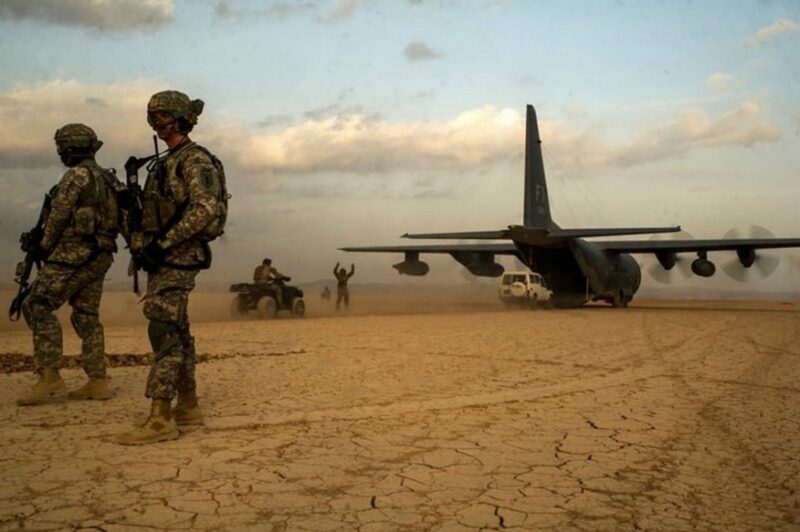 With all of that information, MC-130s or C-146s could parachute commandos into a dangerous locale like the Kurdish-occupied areas of Northern Syria. If the AZRT figured the area was suitable, those same planes may land on a flat stretch of dirt serving as an impromptu airstrip. A four-engine MC-130 could even set up what the Air Force calls a forward area refueling point — a sort of portable gas station, also known a FARP — in a friendly or neutral area to top off Ospreys or other aircraft for the rest of their journey. American commandos — along with conventional troops — regularly train to land in such remote sites. In the video footage above, an Air Force team practices quickly refueling a U-28A spy plane in a characteristic civilian-style paint scheme at a mock FARP at Hulburt Field in Florida in May 2015. War Is Boring obtained the film via the Freedom of Information Act. And in November 2014, the Air Force briefly let slip a video showing an MC-130H Combat Talon II refueling U.S. Army MH-60M helicopters in Iraq — both in the air and on the ground. Kurdish and American commandos may have used a similar arrangement when they flew into Hawijah, Iraq to rescue hostages from an Islamic State prison. With all of this existing infrastructure in place, the Pentagon should have no trouble getting its commandos to their final destination. It’s quite possible some of those troops have already visited this Middle Eastern battlefield. On Oct. 12, the Air Force dropped 50 tons of supplies to American-backed groups in Syria. Since the rebel fighters reportedly snagged all the pallets successfully, the Pentagon most likely coordinated this massive airdrop with those groups — and possibly American forces — on the ground. Special tactics units were likely involved at least in the planning process. The newly arriving commandos in Syria will not officially be on a “combat mission” either, White House Press Secretary Josh Earnest told reporters on Oct. 30. If the friendly rebels cannot hold off either Islamic State or the Syrian regime, the Americans may need to bug out in a hurry. In an emergency, the same landing sites the Air Force uses to get the special operators into the country could serve to get them out. Besides, if a hostile force overruns one location, the flying branch will have other options thanks to the AZRTs. And whatever happens with the mission in Syria, the Pentagon will still have its list of drop zones to help commandos sneak all over the Middle East at a moment’s notice.